COMING SOON – OUR NEW ONLINE VOLUNTEER PLATFORM! Thank you so much for your interest in volunteering at Lighthouse! Assist congregations during their hosting week. Sometimes congregations need extra drivers and overnight supervisors. This function is vital in assuring our organization continues to operate smoothly. All volunteers for congregation support need to be flexible. These opportunities call for individuals who can adapt to different environments. Times and locations may vary. Interested in becoming a host site? Contact LaTasha Lotts, Shelter Coordinator, at latasha@oaklandshelter.org to inquire about open hosting weeks, schedule a time to visit a host site, and discover other ways you can support our shelter. The receptionist is the first contact that our callers and visitors encounter. There are current openings for receptionists in four areas within Lighthouse. The shifts are from 8:00am – noon or noon – 4pm Monday-Friday. If you have a valid driver’s license and are able to lift up to 45 lbs, we are always in need of drivers to assist us in picking up donations from within the community. Donations can consist of food, household items, or small furniture. We need drivers on a weekly basis, as well as additional drivers willing to be on call Monday-Friday 8am-4pm. Transportation continues to be a major barrier among the homeless population. Many of our clients need rides to appointments and job interviews they have arranged throughout the day. This is a great way to help our clients on the path towards self sufficiency. All volunteer drivers utilize their personal vehicles and must present a valid license with updated registration and insurance. 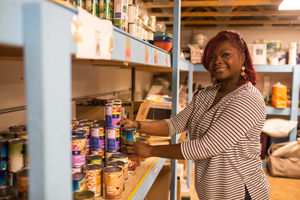 Transportation support is needed at the Lathrup Village location Monday through Friday 9:00 a.m. to 1:00 p.m. and 1:00 p.m. to 5:00 p.m.
Lighthouse is always in need of volunteers to help in our pantry sorting food and stocking the shelves. Pantry volunteers also pack food for the individuals and families who come to us for help. Our pantry is the only pantry in Oakland County that operates 5 days per week and services all of Oakland County. The hours of operation are 9:30am – 3:00pm Monday – Friday. Help sort, hang, fold, stock, and organize donations of clothing, food, and housewares. We need help organizing donations at our Lathrup Village location Monday through Friday and Sundays from 9:00 a.m. to 7:00 p.m. This activity calls for hard working, self-motivated and detail-oriented volunteers. We currently have a great need for self-motivated individuals who are willing and able to facilitate classes for clients at our Lathrup Village location. Examples of classes held by volunteers at SOS include: Resume and Cover Letter Assistance, Financial Literacy, Adult Literacy, Mock Interviews, Creative Writing, Computer Skills, Parenting Classes and Navigating a Career in Transition, Yoga, Karate, Art Therapy, Guitar Lessons, Singing Lessons, and Knitting. Provide educational support to clients at our Lathrup Village location by assisting with homework, school projects, as well teaching positive study skills. Tutoring takes place at 5:00 p.m. at the Lathrup Village office or at 7:00 p.m. at the host site. Tutors should come once every week. Lighthouse offers volunteer opportunities for groups from all kinds of schools, churches, clubs, organizations, workplaces, etc. Working as a team in a setting that is not a normal work setting can provide many benefits. Employees can develop better communication and team working skills through volunteering. Assist congregations during their hosting week. Sometimes congregations need extra drivers and overnight supervisors. This function is vital in assuring our SOS program continues to operate smoothly. 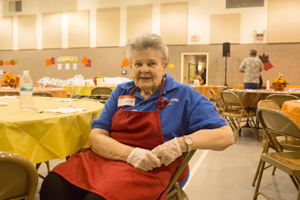 All volunteers for congregation support need to be flexible. These opportunities call for individuals who can adapt to different environments. Times and locations may vary. Volunteering as a team takes teamwork to a whole new level. There are many benefits of volunteering as a team. You’ll gain a huge sense of achievement as a group. You’ll work towards your company’s policy for Corporate Social Responsibility. You’ll partake in something memorable that couldn’t be done by sitting in a conference room. Volunteering with your work group can be a wonderful team-building experience.